I love my Garmin Nuvi. As I’ve mentioned before it’s one of the best pieces of technology I own for use, form factor, fun, and coolness factor. I’ve got the 260 which suits me fine, but if I had to buy a new one, I’d get the 760 now. One of the weird things is that I keep it on all the time when I’m driving, even if I know where I’m going. The points of interest (POI) feature is awesome and has helped me discover new places to eat every once in a while. There are other customizations you can achieve as well like custom voices (I have the UK and Australian female voices on mine to make me feel distinguished) and icons. All of these are generally announced on the Garmin blog, which is regularly updated with information about Nuvi and all their other product lines. You can get custom icons from the Garmin Garage location as well. One thing that I highly recommend is using the POI Loader. This software enables you to create your own POI waypoints. You can create them as regular POI waypoints or you can also create “proximity” points that alert you when you are getting near a specific point. This is generally why I keep it on all the time now. I’ve created a few of my own POI waypoints for areas of construction that I might forget about, some speed limit changes that I may forget about, etc. Recently though, I also found a guy who has organized all photo radar points into a database (you could create your own of course) and sells them for $10 for a 12-month subscription. Boom, done. Saves me the time looking them all up and I just have to click and they are uploaded. The database (which I found on eBay and he has Arizona database as well as other states for photo radar) contains not only fixed points, but also “known” speed trap regular areas. Just this morning I was on my way to Costco and was alerted to slow down with a notification of a potential speed trap (they weren’t there this morning, but they are regularly there for sure as my wife’s driving record will attest to). 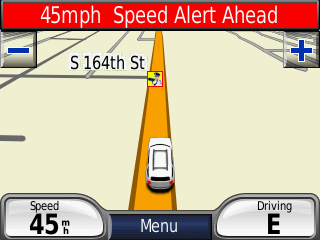 The image (which is the image captured here) displays an icon (notice the little radar dude) as well as a warning banner. A sound is also audible as well to help you pay attention to the warning. Very cool. For $10 I get database updates monthly from this guy (which has 1197 points for Arizona). Hopefully recent movements by our Arizona state legislature may make me worry less, but until then this helps remind me to drive safe and also keeps me out of trouble (hopefully). UPDATE: The service I used to use isn't available anymore, but if you want to get red-light/radar points-of-interest (POI) for your GPS device, you can get them here. The other “customization” I made this week was to purchase the lifetime map subscription. I’ve been royally burned by lifetime subscriptions in the past, so I was leery on doing this, especially since the lifetime subscription applies only to the particular device. I knew, however, that I was going to get at least one more map update, so for the extra $30, I get 4 updates per year for the lifetime of my device. Seemed worth it to me at the time of purchase. The update was surprisingly huge (1.5GB) but now I’ve got the latest map, updates for “life” and 1197 statewide radar alerts plus my own custom points. If you have a Garmin device…have fun customizing!